In Christianity, an antinomian is one who takes the principle of salvation by faith and divine grace to the point of asserting that the saved are not bound to follow the moral law contained in the Ten Commandments. The distinction between antinomian and other Christian views on moral law is that antinomians believe that obedience to the law is motivated by an internal principle flowing from belief rather than from any external compulsion. Examples of antinomians being confronted by the religious establishment include Martin Luther's critique of antinomianism and the Antinomian Controversy of the seventeenth-century Massachusetts Bay Colony. In the Lutheran Churches and Methodist Churches, antinomianism is considered a heresy. Outside of Christianity, the tenth-century Sufi mystic Mansur Al-Hallaj was accused of antinomianism and the term is also used to describe certain practices or traditions in Frankism, Buddhism and Hinduism, such as the transgressive aspects of Vajrayana and Hindu Tantra which include sexual elements. The term antinomianism is derived from the Greek ἀντί (anti "against") + νόμος (nomos "law"). Antinomianism has been a point of doctrinal contention in the history of Christianity, especially in Protestantism, given the Protestant belief in justification through faith alone versus justification on the basis of merit or good works or works of mercy. Most Protestants consider themselves saved without having to keep the commandments of the Mosaic law as a whole; that is, their salvation does not depend upon keeping the Mosaic law. However, salvific faith is generally seen as one that produces obedience, consistent with the reformed formula, "We are justified by faith alone but not by a faith that is alone," in contrast to rejecting moral constraint. The term antinomianism was coined by Martin Luther during the Reformation to criticize extreme interpretations of the new Lutheran soteriology. In the 18th century, John Wesley, the founder of the Methodist tradition, severely attacked antinomianism. A general consensus has been historically reached as to which laws of the Old Testament Christians are still enjoined to keep. These moral laws, as opposed to civil or ceremonial laws, are derivative of what St. Paul indirectly refers to as natural law (Rom. 2.14–15). Mosaic law has authority only insofar as it reflects the commands of Christ and the natural law. Christian sects and theologians who believe that they are freed from more moral constraint than is customary are often called "antinomian" by their critics. Thus, classic Methodist commentator Adam Clarke held, "The Gospel proclaims liberty from the ceremonial law, but binds you still faster under the moral law. To be freed from the ceremonial law is the Gospel liberty; to pretend freedom from the moral law is Antinomianism." The term antinomian came into use in the sixteenth century, however, the doctrine itself can be traced in the teaching of earlier beliefs. Early Gnostic sects were accused of failure to follow the Mosaic Law in a manner that suggests the modern term "antinomian". Most Gnostic sects did not accept the Old Testament moral law. For example, the Manichaeans held that their spiritual being was unaffected by the action of matter and regarded carnal sins as being, at worst, forms of bodily disease. The Old Testament was absolutely rejected by most of the Gnostics. Even the so-called Judaeo-Christian Gnostics (Cerinthus), the Ebionites (Essenian) sect of the Pseudo-Clementine writings (the Elcesaites), take up an inconsistent attitude towards Jewish antiquity and the Old Testament. In this respect the opposition to Gnosticism led to a reactionary movement. If the growing Christian Church, in quite a different fashion from Paul, laid stress on the literal authority of the Old Testament, interpreted, it is true, allegorically; if it took up a much more friendly and definite attitude towards the Old Testament, and gave wider scope to the legal conception of religion, this must be in part ascribed to the involuntary reaction upon it of Gnosticism. Marcion of Sinope was the founder of Marcionism which rejected the Hebrew Bible in its entirety. Marcion considered the God portrayed in the Bible to be a lesser deity, a demiurge, and he claimed that the law of Moses was contrived. Such deviations from the moral law were criticized by proto-orthodox rivals of the Gnostics, who ascribed various aberrant and licentious acts to them. A biblical example of such criticism can be found in Revelation 2:6–15, which criticizes the Nicolaitans, possibly an early Gnostic sect. The term "antinomianism" was coined by Martin Luther during the Reformation, to criticize extreme interpretations of the new Lutheran soteriology. The Lutheran Church benefited from early antinomian controversies by becoming more precise in distinguishing between Law and Gospel and justification and sanctification. Martin Luther developed 258 theses during his six antinomian disputations, which continue to provide doctrinal guidance to Lutherans today. Upon hearing that he was being charged with rejection of the Old Testament moral law[not in citation given], Luther responded: "And truly, I wonder exceedingly, how it came to be imputed to me, that I should reject the Law or ten Commandments, there being extant so many of my own expositions (and those of several sorts) upon the Commandments, which also are daily expounded, and used in our Churches, to say nothing of the Confession and Apology, and other books of ours." In his "Introduction to Romans," Luther stated that saving faith is, "a living, creative, active and powerful thing, this faith. Faith cannot help doing good works constantly. It doesn't stop to ask if good works ought to be done, but before anyone asks, it already has done them and continues to do them without ceasing. Anyone who does not do good works in this manner is an unbeliever...Thus, it is just as impossible to separate faith and works as it is to separate heat and light from fire!" As early as 1525, Johannes Agricola advanced his idea, in his commentary on Luke, that the law was a futile attempt of God to work the restoration of mankind. He maintained that non-Christians were still held to the Mosaic law, while Christians were entirely free from it, being under the Gospel alone. He viewed sin as a malady or impurity rather than an offense which rendered the sinner guilty and damnable before God. The sinner was the subject of God's pity rather than of his wrath. To Agricola, the purpose of repentance was to abstain from evil rather than the contrition of a guilty conscience. The law had no role in repentance, which came about after one came to faith, and repentance was caused by the knowledge of the love of God alone. In contrast, Philipp Melanchthon urged that repentance must precede faith, and that knowledge of the moral law is needed to produce repentance. He later wrote in the Augsburg Confession that repentance has two parts. "One is contrition, that is, terrors smiting the conscience through the knowledge of sin; the other is faith, which is born of the Gospel, or of absolution, and believes that for Christ's sake, sins are forgiven, comforts the conscience, and delivers it from terrors." Luther, with reluctance, at last believed that he had to make public comment against antinomianism and its promoters in 1538 and 1539. Agricola apparently yielded, and Luther's book Against the Antinomians (1539)[not in citation given] was to serve as Agricola's recantation. This was the first use of the term Antinomian. But the conflict flared up again, and Agricola sued Luther. He said that Luther had slandered him in his disputations, Against the Antinomians, and in his On the Councils and Churches (1539). But before the case could be brought to trial, Agricola left the city, even though he had bound himself to remain at Wittenberg, and moved to Berlin where he had been offered a position as preacher to the court. After his arrival there, he made peace with the Saxons, acknowledged his "error", and gradually conformed his doctrine to that which he had before opposed and assailed. He still used such terms as gospel and repentance in a different manner than Luther. The antinomian doctrine, however, was not eliminated from Lutheranism. Melanchthon and those who agreed with him, called Philippists, were checked by the Gnesio-Lutherans in the Second Antinomian Controversy during the Augsburg Interim. The Philippists ascribed to the Gospel alone the ability to work repentance, to the exclusion of the law. They blurred the distinction between Law and Gospel by considering the Gospel itself to be a moral law. They did not identify Christ's fulfillment of the law with the commandments which humans are expected to follow. As a result, the Book of Concord rejects antinomianism in the last confession of faith. The Formula of Concord rejects antinominism in the fifth article, On the Law and the Gospel and in the sixth article, On the Third Use of the Law. The Articles of the Church of England, Revised and altered by the Assembly of Divines, at Westminster, in the year 1643 condemns antinomianism, teaching that "no Christian man whatsoever is free from the obedience of the commandments which are called moral. By the moral law, we understand all the Ten Commandments taken in their full extent." The Westminster Confession, held by Presbyterian Churches, holds that the moral law contained in the Ten Commandments "does forever bind all, as well justified persons as others, to the obedience thereof". The Westminster Confession of Faith further states: "Faith, thus receiving and resting on Christ and His righteousness, is the alone instrument of justification; yet it is not alone in the person justified, but is ever accompanied with all other saving graces, and is no dead faith, but works by love." However, a number of seventeenth-century English writers in the Reformed tradition held antinomian beliefs. None of these individuals argued that Christians would not obey the law. Instead, they believed that believers would spontaneously obey the law without external motivation. Antinomianism during this period is likely a reaction against Arminianism, as it emphasized free grace in salvation to the detriment of any participation on the part of the believer. John Eaton (fl. 1619) is often identified as the father of English antinomianism. Tobias Crisp (1600–1643), a Church of England priest has been accused of being an antinomian. He was a divisive figure for English Calvinists, with a serious controversy arising from the republication of his works in the 1690s. From the latter part of the 18th century, critics of Calvinists accused them of antinomianism. Such charges were frequently raised by Arminian Methodists, who subscribed to a synergistic soteriology that contrasted with Calvinism's monergistic doctrine of justification. The controversy between Arminian and Calvinistic Methodists produced the notable Arminian critique of Calvinism: Fletcher's Five Checks to Antinomianism (1771–75). John Wesley, the founder of the Methodist tradition, harshly criticized antinomianism, considering it the "worst of all heresies". He taught that Christian believers are bound to follow the moral law and that they are to partake in the means of grace for their sanctification. Methodists teach the necessity of following the moral law as contained in the Ten Commandments, citing Jesus' teaching, "If ye love me, keep my commandments" (cf. Saint John 14:15). Religious Society of Friends were charged with antinomianism due to their rejection of a graduate clergy and a clerical administrative structure, as well as their reliance on the Spirit (as revealed by the Inner Light of God within each person) rather than the Scriptures. They also rejected civil legal authorities and their laws (such as the paying of tithes to the State church and the swearing of oaths) when they were seen as inconsistent with the promptings of the Inner Light of God. Blaise Pascal accused the Jesuits of antinomianism in his Lettres provinciales, charging that Jesuit casuistry undermined moral principles. Other Protestant groups that have been accused of antinomianism include the Anabaptists and Mennonites. The Ranters of 17th century England were one of the most outright antinomian sects in the history of Christianity. New Covenant Theology has been accused of antinomianism for their belief that the Ten Commandments have been abrogated, but they point out that nine of these ten are renewed under the New Covenant's Law of Christ. Icon of James the Just, whose judgment was adopted in the Apostolic Decree of Acts 15:19–29, c. 50 AD. The question of the obligation to follow the Mosaic Law was a point of contention in the Early Christian Church. Many early converts were Greek and thus had less interest in adherence to the Law of Moses than did the earliest Christians, who were primarily Jewish and already accustomed to the Law. Thus, as Christianity spread into new cultures, the early church was pressured[by whom?] to decide which laws were still required of Christians, and which were no longer required under the New Covenant. The New Testament, (especially the book of Acts) is interpreted by some[who?] as recording the church slowly abandoning the "ritual laws" of Judaism, such as circumcision, Sabbath and kosher law, while remaining in full agreement on adherence to the "divine law", or Jewish laws on morality, such as the Ten Commandments. Thus, the early Christian church incorporated ideas sometimes seen as partially antinomian or parallel to Dual-covenant theology, while still upholding the traditional laws of moral behavior. But then some of the believers who belonged to the sect of the Pharisees stood up and insisted, "The Gentile converts must be circumcised and required to follow the law of Moses." Acts 15:(19) Wherefore my [James] sentence is, that we trouble not them, which from among the Gentiles are turned to God: (20) But that we write unto them, that they abstain from pollutions of idols, and from fornication, and from things strangled, and from blood. (21) For Moses of old time hath in every city them that preach him, being read in the synagogues every Sabbath day. Beginning with Augustine of Hippo, many have seen a connection to Noahide Law, while some modern scholars reject the connection to Noahide Law and instead see Lev 17–18 as the basis. James sets out a preliminary list of commands which Gentiles should obey. Gentiles were not required to be circumcised but were required to obey the four beginning requirements to be part of the larger congregation. This passage shows that the remainder of the commandments would follow as they studied "Moses" in the Synagogues. If Gentiles did not follow this reduced requirement, they risked being put out of the Synagogue and missing out on a Torah education (in Leviticus 17 and 20). James's list still includes some dietary commands, but many of those also passed out of some Christian traditions quite early. Acts 10:9–16 describes the following vision, which was used to excuse early gentile Christians from the Mosaic dietary laws. (9) ...Peter went up upon the housetop to pray about the sixth hour: (10) And he became very hungry, and would have eaten: but while they made ready, he fell into a trance, (11) And saw heaven opened, and a certain vessel descending unto him, as it had been a great sheet knit at the four corners, and let down to the earth: (12) Wherein were all manner of fourfooted beasts of the earth, and wild beasts, and creeping things, and fowls of the air. (13) And there came a voice to him, Rise, Peter; kill, and eat. (14) But Peter said, Not so, Lord; for I have never eaten any thing that is common or unclean. (15) And the voice spake unto him again the second time, What God hath cleansed, that call not thou common. (16) This was done thrice: and the vessel was received up again into heaven. Peter was perplexed about the vision in Acts 10. His subsequent explanation of the vision in Acts 11 gives no credence to antinomianism as it relates to the admission of Gentiles into covenant relationship with God. Though the Apostolic Decree is no longer observed by many Christian denominations today, it is still observed in full by the Greek Orthodox. Bring his sons and dress them in tunics and put headbands on them. Then tie sashes on Aaron and his sons. The priesthood is theirs by a lasting ordinance. In this way you shall ordain Aaron and his sons. Artist depiction of Saint Paul Writing His Epistles, 16th century (Blaffer Foundation Collection, Houston, Texas). Most scholars think Paul dictated his letters to a secretary. The Apostle Paul, in his Letters, says that believers are saved by the unearned grace of God, not by good works, "lest anyone should boast", and placed a priority on orthodoxy (right belief) before orthopraxy (right practice). The soteriology of Paul's statements in this matter has long been a matter of dispute. The ancient gnostics interpreted Paul, for example in 2 Peter 3:16, to be referring to the manner in which embarking on a path to enlightenment ultimately leads to enlightenment, which was their idea of what constituted salvation. In what has become the modern Protestant orthodoxy, however, this passage is interpreted as a reference to justification by trusting Christ. Paul used the term freedom in Christ, for example, Galatians 2:4. Some understood this to mean "lawlessness" (i.e. not obeying Mosaic Law). For example, in Acts 18:12–16, Paul is accused of "persuading .. people to worship God in ways contrary to the law." Colossians 2:13–14 is sometimes presented as proof of Paul's antinomistic views. For example, the NIV translates these verses: "... he forgave us all our sins, having canceled the written code, with its regulations, that was against us and that stood opposed to us; he took it away, nailing it to the cross." But, the NRSV translates this same verse as: "... he forgave us all our trespasses, erasing the record that stood against us with its legal demands. He set this aside, nailing it to the cross." This latter translation makes it sound as though it is a record of trespasses, rather than the Law itself, that was "nailed to the cross." The interpretation partly depends on the original Greek word χειρόγραφον which, according to Strong's G5498, literally means "something written by hand;" it is variously translated as "written code" or "record", as in a record of debt. Christians believe that Jesus is the mediator of the New Covenant in Hebrews 8:6. Depicted is his Sermon on the Mount in which he commented on the Law. In Galatians 4:21–31, Paul compares the Old Covenant with the New Covenant. In this comparison, he equates each covenant with a woman, using the wives of Abraham as examples. The old covenant is equated with the slave woman, Hagar, and the new covenant is equated with the free woman Sarah. (Galatians 4:22–26). He concludes this example by saying that we are not children of the slave woman, but children of the free woman. In other words, we are not under the old covenant, we are under the new covenant. Romans 10:4 is sometimes translated: "For Christ is the end of the law for righteousness to every one that believeth." (KJV) The key word here is telos (Strong's G5056). Robert Badenas argues that telos is correctly translated as goal, not end, so that Christ is the goal of the Law. Andy Gaus' version of the New Testament translates this verse as: "Christ is what the law aims at: for every believer to be on the right side of [God's] justice." The first covenant was said to be obsolete, and would soon disappear: "By calling this covenant "new," he has made the first one obsolete; and what is obsolete and aging will soon disappear." Hebrews 8:13. It identifies the first covenant which is disappearing in Hebrews 9:1–5. Particularly the "stone tables of the covenant" in Hebrews 9:4 referred directly to the Ten Commandments. 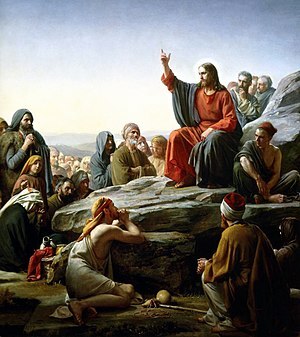 Some scholars consider Jesus' Sermon on the Mount (particularly the Antitheses) to be an antitype of the proclamation of the Ten Commandments or Mosaic Covenant by Moses from the Biblical Mount Sinai. The Catholic Encyclopedia article on "Judaizers" notes: "Paul, on the other hand, not only did not object to the observance of the Mosaic Law, as long as it did not interfere with the liberty of the Gentiles, but he conformed to its prescriptions when occasion required (1 Corinthians 9:20). Thus he shortly after the Council of Jerusalem circumcised Timothy (Acts 16:1–3), and he was in the very act of observing the Mosaic ritual when he was arrested at Jerusalem (21:26 sqq.)." The Jewish Encyclopedia article on "Gentile: Gentiles May Not Be Taught the Torah" notes the following reconciliation: "R. Emden, in a remarkable apology for Christianity contained in his appendix to "Seder 'Olam," gives it as his opinion that the original intention of Jesus, and especially of Paul, was to convert only the Gentiles to the seven moral laws of Noah and to let the Jews follow the Mosaic law—this explains the apparent contradictions in the New Testament regarding the laws of Moses and the Sabbath." The Tübingen school of historians founded by F. C. Baur holds that in Early Christianity, there was conflict between Pauline Christianity and the Jerusalem Church led by James the Just, Simon Peter, and John the Apostle, the so-called "Jewish Christians" or "Pillars of the Church." In many places Paul writes that he was an observant Jew, and that Christians should "uphold the Law" (Romans 3:31). In Galatians 2:14, part of the Incident at Antioch, Paul publicly accused Peter of judaizing. Even so, he says sins remain sins, and upholds by several examples the kind of behaviour that the church should not tolerate (e.g., Galatians 5:19–21, 1 Cor 6:9–10). In 1 Corinthians 7:10–16 he cites Jesus' teaching on divorce ("not I but the Lord") and does not reject it, but goes on to proclaim his own teaching ("I, not the Lord"), an extended counsel regarding a specific situation which some interpret as conforming to what the Lord said. But, this may mean he received direct knowledge of what the Lord wanted him to teach through the Holy Ghost (Galatians 2:6–10). The Epistle of James, in contrast, states that we are to obey the Law of God and that "a person is justified by works and not by faith alone" (James 2:14–26). Historically, this statement has been difficult for Protestants to reconcile with their belief in justification by faith alone as it appears to contradict Paul's teaching that works don't justify (Romans 4:1–8). Martin Luther, believing that his doctrines were refuted by James's conclusion that works also justify, suggested that the Epistle might be a forgery, and relegated it to an appendix in his Bible. Literature which discusses this includes the article on James 2:20 in Law and Gospel. Romans 2:6, Ephesians 2:8–10, and Joint Declaration on the Doctrine of Justification. James also wrote: "For whoever keeps the whole law and yet stumbles at just one point is guilty of breaking all of it. For he who said, 'Do not commit adultery,' also said, 'Do not murder.' If you do not commit adultery but do commit murder, you have become a lawbreaker." James 2:10–11. One interpretation is that people who want to keep the Old Testament Law must perfectly keep all of the Law—"an impossible task." James appeals to his readers to follow the "Royal Law of Love" instead in the preceding verses (James 2:8–9). But the scholar Alister McGrath says that James was the leader of a judaizing party that taught that Gentiles must obey the entire Mosaic Law. "Jesus, however, does not appear to have taken into account the fact that the Halakah was at this period just becoming crystallized, and that much variation existed as to its definite form; the disputes of Bet Hillel and Bet Shammai were occurring about the time of his maturity." In the Gospel of Mark, Jesus' disciples were picking grain for food on the Sabbath (Mark 2:23–28). This was against one of the Pharisaic laws that had been added to the original Torah law which prohibited work on the Sabbath day. When the Pharisees challenged Jesus over breaking their law, he pointed to Biblical precedent and declared that "the Sabbath was made for man, not man for the Sabbath". Some claim Jesus rejected complete adherence to the Torah. Most scholars hold that Jesus did not reject the law, but directed that it should be obeyed in context. E. P. Sanders notes, "No substantial conflict existed between Jesus and the Pharisees with regard to Sabbath, food, and purity laws. ... The church took some while to come to the position that the Sabbath need not be kept, and it is hard to think that Jesus explicitly said so." There may be passages where the words of Jesus have been misinterpreted and were not really in contradiction with the Jewish law. Jesus never once broke the Torah, yet he did denounce the added Pharisaic rules and openly defied the Pharisees. In the Gospel of Matthew, Jesus is sometimes said to refer to people he sees as "wicked" with the term ergazomenoi tēn anomian (ἐργαζόμενοι τὴν ἀνομἰαν)—e.g., Matthew 7:21–23, Matthew 13:40–43. Due to this negative context, the term has almost always been translated as "evildoers", although it literally means "workers of lawlessness". In Hebrew, lawlessness would imply "Torahlessness". Matthew appears to present Jesus as equating wickedness with encouraging antinomianism. Scholars view Matthew as having been written by or for a Jewish audience, the so-called Jewish Christians. Several scholars argue that Matthew artificially lessened a claimed rejection of Jewish law so as not to alienate his intended audience. But, Jesus called for full adherence to the commandments (Matthew 5:19–21) He declared: "Do not think that I have come to abolish the Law or the Prophets; I have not come to abolish them but to fulfill them." (Matthew 5:17). A parallel verse to Matthew 7:21 is James 1:22. 1 John 3:4 states: "Everyone who commits sin is guilty of lawlessness; sin is lawlessness." Among some Buddhist groups there are types of 'antinomianism' which may act as a gloss for 'left-handed attainment' (Sanskrit: Vamachara): naturalist/spontaneous antinomianism, ritualist/philosophical antinomianism, and empirical antinomianism. There may also be those who subscribe to all or some combination of these three types. Not all Buddhist schools accept antinomian thought as skillful. Naturalist antinomians believe that enlightened beings may spontaneously break monastic codes of conduct while living out a natural state of enlightened mind. Another view is that an enlightened mind responds to circumstances based on Buddhist morality, rather than the legalism of the monastic codes, and that the "break" is not therefore spontaneous. There are tales of Buddhists who perform acts that appear to be bizarre or immoral, sometimes referred to as 'crazy wisdom' (Tibetan: yeshe chölwa). The movement of the Nyönpa in Seventeenth Century Tibet has strong associations with antinomian behavior as well. Ritualist antinomians, such as some Tantric Buddhists, may practice which seemingly may appear to be breaking the codes of conduct in specific religious rituals designed to teach non-duality or other philosophical concepts. Empirical antinomians may break or disregard traditional ethical or moral rules that they believe are unconducive to the individual's contemplative life. They view such codification as having arisen in specific historical-cultural contexts and, as such, not always supportive of Buddhist training. Thus the individual and the community must test and verify which rules promote or hinder enlightenment. Actions, behavior, or beliefs that are considered to violate any or all of these four sources—primarily in matters of religion—can be termed "antinomian". Depending on the action, behavior, or belief in question, a number of different terms can be used to convey the sense of "antinomian": shirk ("association of another being with God"); bidʿah ("innovation"); kufr ("disbelief"); ḥarām ("forbidden"); etc. As an example, the 10th-century Sufi mystic Mansur Al-Hallaj was executed for shirk for, among other things, his statement ana al-Ḥaqq (أنا الحق), meaning "I am the Truth". As al-Ḥaqq ("the Truth") is one of the 99 names of God in Islamic tradition, this would imply he was saying: "I am God." Expressions like these are known as Shathiyat. Another individual who has often been termed antinomian is Ibn Arabi, a 12th–13th century scholar and mystic whose doctrine of waḥdat al-wujūd ("unity of being") has sometimes been interpreted as being pantheistic, and thus shirk. Apart from individuals, entire groups of Muslims have also been called antinomian. One of these groups is the Nizārī Ismāʿīlī Shīʿīs, who have always had strong millenarian tendencies arising partly from persecution directed at them by Sunnīs. Influenced to a certain extent by Gnosticism, the Ismāʿīlīs developed a number of beliefs and practices—such as their belief in the imāmah and an esoteric exegesis of the Qurʾān—that orthodox Sunnī Muslims considered to be shirk and, hence, to be seen as antinomian. Certain other groups that evolved out of Shīʿah belief, such as the Alawis and the Bektashis, have also been considered antinomian. The Bektashis, particularly, have practices that diverge from conventional Islamic practice, such as the consumption of alcoholic beverages, the non-wearing of the ḥijāb ("veil") by women, and gathering in the Cem Evi in preference to the mosque. In contemporary studies of western esotericism, antinomianism is regarded as "a central ingredient in Left-Hand Path spiritualities," and understood as "nonconformity through the concept of transgression". This extends the modern usage of the term, from simply implying that "moral laws are relative in meaning and application", to include the avowed irreligion manifest in modern Satanism. In his study of late-20th-century western society the historian Eric Hobsbawm stated that there was a new fusion of demotic and antinomian characteristics that made the period distinct, and appeared to be likely to extend into the future. For him there is now a readiness by the mass of people to have little sense of obligation to obey any set of rules that they consider arbitrary, or even just constraining, whatever its source. This may be facilitated by one or more of several changes. These include the tendency to live outside settled communities, the growth of enough wealth for most people to have a wide choice of styles of living and a popularised assumption that individual freedom is an unqualified good. George Orwell was a frequent user of "antinomian" in a secular (and always approving) sense. In his 1940 essay on Henry Miller, "Inside the Whale", the word appears several times, including one in which he calls A. E. Housman a writer in "a blasphemous, antinomian, ‘cynical’ strain", meaning defiant of arbitrary societal rules. The psychologist, Nathan Adler, defined the "antinomian personality type" as "manifested by one whose frame of reference is threatened or has been disrupted. He suffers from a breakdown in the balance of his control and release mechanisms and from the permeability of his body boundaries." ^ Puritans and Puritanism in Europe and America. ABC-CLIO. 2006. p. 306. ISBN 9781576076781. ^ Marie, André (17 September 2013). "Simian Antinomianism". Slaves of the Immaculate Heart of Mary. Retrieved 28 May 2018. ^ a b Como, David R. (2004). Blown by the Spirit: Puritanism and the Emergence of an Antinomian Underground in Pre-Civil-War England. Stanford, CA: Stanford University Press. p. 36. ISBN 9780804744430. ^ Failinger, Marie; Duty, Ronald W. (17 April 2017). Lutheran Theology and Secular Law: The Work of the Modern State. Taylor & Francis. p. 81. ISBN 9781351996075. ^ Hugh B. Urban. The Power of Tantra: Religion, Sexuality and the Politics of South Asian Studies, chapter five. ^ Essential Truths of the Christian Faith. Google Books. p. 191. One or more of the preceding sentences incorporates text from a publication now in the public domain: Chisholm, Hugh, ed. (1911). "Antinomians" . Encyclopædia Britannica. 2 (11th ed.). Cambridge University Press. pp. 129–130. ^ Martin Chemnitz, Examination of the Council of Trent: Vol. III. trans. Fred Kramer, St. Louis: Concordia Publishing House, 1986, p. 150, "Second Topic, Concerning the Celibacy of Priests", chapter IV, "History of the Celibacy of Priests from the Time of the Apostles Down to Our Times". ^ "A Treatise against Antinomians, written in an Epistolary way"
^ Dr. Martin Luther. "A Treatise Against the Antinomians". Truecovenanter.com. Retrieved 2012-11-07. ^ "Westminster Confession of Faith, Chapter XI, Of Justification". Spurgeon.org. Archived from the original on 2011-07-28. ^ a b Wallace, Dewey D., Jr. (1982). Puritans and Predestination: Grace in English Protestant Theology, 1525–1695. Chapel Hill, N.C.: University of North Carolina Press. p. 114. ^ Barry H. Howson, Erroneous and Schismatical Opinions: The Questions of Orthodoxy Regarding the Theology of Hanserd Knollys (c. 1599–1691) (2001), p. 158. ^ a b Jr., Charles Yrigoyen; Warrick, Susan E. (7 November 2013). Historical Dictionary of Methodism. Scarecrow Press. p. 30. ISBN 9780810878945. ^ The Wesleyan Methodist Association Magazine. 12. R. Abercrombie. 1849. p. 368. ^ The Law, the Gospel, and the Modern Christian: Five Views, Grand Rapids: Zondervan, 1993. ISBN 978-0-310-53321-4, also republished as Five Views on Law and Gospel, page 343: "The entire Mosaic law comes to fulfillment in Christ, and this fulfillment means that this law is no longer a direct and immediate source of, or judge of, the conduct of God's people. Christian behavior, rather, is now guided directly by "the law of Christ". This "law" does not consist of legal prescriptions and ordinances, but of the teaching and example of Jesus and the apostles, the central demand of love, and the guiding influence of the indwelling Holy Spirit. ", page 376: "The content of all but one of the Ten Commandments is taken up into "the law of Christ", for which we are responsible. (The exception is the Sabbath commandment, one that Heb. 3–4 suggests is fulfilled in the new age as a whole.)" ^ In Acts 6:13–14 Saint Stephen is accused by "false witnesses" of speaking against the law, presumably a minor dispute. ^ Jewish Encyclopedia: Baptism: "According to rabbinical teachings, which dominated even during the existence of the Temple (Pes. viii. 8), Baptism, next to circumcision and sacrifice, was an absolutely necessary condition to be fulfilled by a proselyte to Judaism (Yeb. 46b, 47b; Ker. 9a; 'Ab. Zarah 57a; Shab. 135a; Yer. Kid. iii. 14, 64d). Circumcision, however, was much more important, and, like baptism, was called a "seal" (Schlatter, Die Kirche Jerusalems, 1898, p. 70). But as circumcision was discarded by Christianity, and the sacrifices had ceased, Baptism remained the sole condition for initiation into religious life. The next ceremony, adopted shortly after the others, was the imposition of hands, which, it is known, was the usage of the Jews at the ordination of a rabbi. Anointing with oil, which at first also accompanied the act of Baptism, and was analogous to the anointment of priests among the Jews, was not a necessary condition." ^ McGrath, Alister E., Christianity: An Introduction, Blackwell Publishing,(2006), ISBN 1-4051-0899-1, Page 174: "In effect, they [Jewish Christians] seemed to regard Christianity as an affirmation of every aspect of contemporary Judaism, with the addition of one extra belief — that Jesus was the Messiah. Unless males were circumcised, they could not be saved (Acts 15:1)." "We further see that, at the time of the Synod of Gangra, the rule of the Apostolic Synod with regard to blood and things strangled was still in force. With the Greeks, indeed, it continued always in force as their Euchologies still show. Balsamon also, the well-known commentator on the canons of the Middle Ages, in his commentary on the sixty-third Apostolic Canon, expressly blames the Latins because they had ceased to observe this command. What the Latin Church, however, thought on this subject about the year 400, is shown by St. Augustine in his work Contra Faustum, where he states that the Apostles had given this command in order to unite the heathens and Jews in the one ark of Noah; but that then, when the barrier between Jewish and heathen converts had fallen, this command concerning things strangled and blood had lost its meaning, and was only observed by few. But still, as late as the eighth century, Pope Gregory the Third (731) forbade the eating of blood or things strangled under threat of a penance of forty days. No one will pretend that the disciplinary enactments of any council, even though it be one of the undisputed Ecumenical Synods, can be of greater and more unchanging force than the decree of that first council, held by the Holy Apostles at Jerusalem, and the fact that its decree has been obsolete for centuries in the West is proof that even Ecumenical canons may be of only temporary utility and may be repealed by disuse, like other laws." ^ Harris, Stephen L., Understanding the Bible, Palo Alto: Mayfield. 1985. p. 316–320. Harris cites Galatians 6:11, Romans 16:22, Colossians 4:18, 2 Thessalonians 3:17, Philemon 19. Joseph Barber Lightfoot in his Commentary on the Epistle to the Galatians writes: "At this point [Galatians 6:11] the apostle takes the pen from his amanuensis, and the concluding paragraph is written with his own hand. From the time when letters began to be forged in his name (2 Thessalonians 2:2; 2 Thessalonians 3:17) it seems to have been his practice to close with a few words in his own handwriting, as a precaution against such forgeries... In the present case he writes a whole paragraph, summing up the main lessons of the epistle in terse, eager, disjointed sentences. He writes it, too, in large, bold characters (Gr. pelikois grammasin), that his handwriting may reflect the energy and determination of his soul." ^ "Gentile: Gentiles May Not Be Taught the Torah"
^ Catholic Encyclopedia: "St. James the Less": "Then we lose sight of James till St. Paul, three years after his conversion (A.D. 37), went up to Jerusalem. ... On the same occasion, the "pillars" of the Church, James, Peter, and John "gave to me (Paul) and Barnabas the right hands of fellowship; that we should go unto the Gentiles, and they unto the circumcision" (Galatians 2:9)." ^ McGrath, Alister E., Christianity: An Introduction, Blackwell Publishing (2006). ISBN 1-4051-0899-1, p. 174: "Paul notes the emergence of a Judaizing party in the region — that is, a group within the church which insisted that Gentile believers should obey every aspect of the law of Moses, including the need to be circumcised. According to Paul [reference is made to Galatians, but no specific verse is given], the leading force behind this party was James ... the brother of Jesus ..."
^ E. P. Sanders, Jesus and Judaism, 1985 SCM Press ISBN 0-334-02091-3, pp. 264–69. ^ A Greek-English Lexicon of the New Testament and Other Early Christian Literature, Bauer, Gingrich, Danker; Young's Literal Translation: "ye who are working lawlessness"; New American Standard Bible: "You who practice lawlessness"; NKJV: "you who practice lawlessness"
^ Trungpa, C. (2001) Crazy Wisdom (Boston). ^ Nydahl, O. (2004). "Verrückte Weisheit: und der Stil des Verwirklichers" Buddhismus Heute 37: 48–57. Retrieved 2012-12-14. Translated as: Nydahl, O. (2003). "Crazy Wisdom". Diamond Way Time 1: 48–54. Retrieved 2012-12-14. ^ See, for example, "Isma'ilism" at Encyclopaedia of the Orient. ^ Bar-Asher & Kofsky, 67 ff. ^ Weir "Differences Between Bektashism and Islamic Orthodoxy"
^ Granholm, Kennet. Embracing Others than Satan: The Multiple Princes of Darkness in the Left-Hand Path Milieu, in Contemporary Religious Satanism: A Critical Anthology. Ashgate Publishing (2009) pp. 84–101. ^ Petersen, Jesper Aagaard. Smite Him Hip and Thigh: Satanism, Violence, and Transgression, in Violence and New Religious Movements, Oxford University Press, 2011. p. 353. ^ Powell, Adam J. (2015). Irenaeus, Joseph Smith, and God-Making Heresy. Fairleigh Dickinson University Press. p. 88 – via Google Books. Badenas, Robert. Christ the End of the Law, Romans 10.4 in Pauline Perspective 1985 ISBN 0-905774-93-0 argues that telos is correctly translated as goal, not end, so that Christ is the goal of the Law, end of the law would be antinomianism. Bar-Asher, Me'ir Mikha'el and Kofsky, Aryeh. The Nuṣayrī-ʿAlawī Religion: An Enquiry into its Theology and Liturgy. Leiden: Koninklijke Brill NV, 2002. ISBN 90-04-12552-3. Chittick, William C. The Sufi Path of Knowledge: Ibn Al-Arabi's Metaphysics of Imagination. Albany: State University of New York Press, 1989. ISBN 0-88706-885-5. Clarence-Smith, W.G. Islam and the Abolition of Slavery. London: C. Hurst & Co. (Publishers) Ltd, 2006. ISBN 1-85065-708-4. Daftary, Farhad; ed. Mediaeval Ismaʿili History and Thought. Cambridge: Cambridge University Press, 1996. ISBN 0-521-45140-X. Encyclopaedia of the Orient. "Isma'ilism". Retrieved 10 October 2006. Pratt, Douglas. The Challenge of Islam: Encounters in Interfaith Dialogue. Aldershot, Hampshire: Ashgate Publishing Limited, 2005. ISBN 0-7546-5122-3. Schimmel, Annemarie. Mystical Dimensions of Islam. ISBN 0-8078-1271-4. Look up antinomianism in Wiktionary, the free dictionary. Henry Eyster Jacobs, Lutheran Cyclopedia p. 18, "Antinomianism"